By LaGayle ~ October 9th, 2013. While the roasted eye of round roast was the main course for this challenging wine pairing dinner, it was the shallot sauce that added something extra to the meat. Roasted beef can get a little boring if you’re not careful. I love beef, but I do like to see what can be done to give it a little more personality. In the case of this meal, the shallot sauce was the star. It was an easy sauce to make with ingredients that included shallots, red wine, and country Dijon mustard, but it certainly added to the overall flavors of the roasted meat as well as the entire meal. 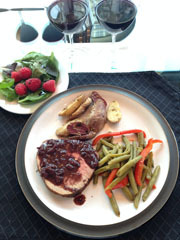 In addition to the roasted eye of round roast with the shallot sauce, we had a mixed green salad with fresh raspberries drizzled with blackberry ginger balsamic vinegar, seasoned green beans with sautéed red bell peppers, and rosemary roasted tri-colored fingerling potatoes. In addition to being yummy, the various side dishes made a very colorful presentation. As always, I referred to my favorite book, What to Drink with What You Eat, and decided to try a Cabernet Franc and a Merlot with this meal. 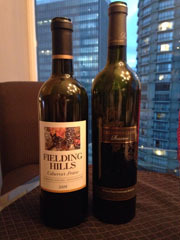 We selected the 2009 Fielding Hills Cabernet Franc and the 2009 Columbia Crest Reserve Merlot, both from Washington State. Both wines were excellent, but the unanimous choice as the best pairing was the Cabernet Franc. What would you have paired with this meal? Your suggestions for future challenging pairings are always welcome. 2009 Fielding Hills Cabernet Franc (Riverbend Vineyard, Wahluke Slope, Washington): Deep, dark purple. Nice nose with black cherry and spice aromas. More black cherry and spice as well as herbs and a touch of earth come through on the palate. Full-bodied with crisp acidity and medium to high tannins. Well-balanced and smooth with a long, lingering finish. 2009 Columbia Crest Reserve Merlot (Stone Tree Vineyard, Wahluke Slope, Washington): Deep, dark purple. Nose is a bit tight at first and then plum aromas come through. Plum and black pepper dominate the palate. Medium to full-bodied with lively acidity and medium tannins. Well-balanced with a very long finish.